Background: The role of eicosanoids, including leukotrienes (LTs) and prostaglandins (PGs), in chronic obstructive pulmonary disease (COPD) is uncertain. The aim of this study was to investigate whether eicosanoids are measurable in exhaled breath condensate (EBC), a non-invasive method of collecting airway secretions, in patients with stable mild to moderate COPD, and to show possible differences in their concentrations compared with control subjects. Methods: LTB4, LTE4, PGE2, PGD2-methoxime, PGF2α, and thromboxane B2 (TxB2) were measured in EBC in 15 healthy ex-smokers, 20 steroid naïve patients with COPD who were ex-smokers, and in 25 patients with COPD who were ex-smokers and who were treated with inhaled corticosteroids. The study was of cross sectional design and all subjects were matched for age and smoking habit. Results: LTB4 and PGE2 concentrations were increased in steroid naïve (LTB4: median 100.6 (range 73.5–145.0) pg/ml, p<0.001; PGE2: 98.0 (range 57.0–128.4) pg/ml, p<0.001) and steroid treated patients with COPD (LTB4: 99.0 (range 57.9–170.5) pg/ml, p<0.001; PGE2: 93.6 (range 52.8–157.0) pg/ml, p<0.001) compared with control subjects (LTB4: 38.1 (range 31.2–53.6) pg/ml; PGE2: 44.3 (range 30.2–52.1) pg/ml). Both groups of patients had similar concentrations of exhaled LTB4 (p=0.43) and PGE2 (p=0.59). When measurable, LTE4 and PGD2-methoxime concentrations were similar in COPD patients and controls, whereas PGF2α concentrations were increased in the former. TxB2-LI was undetectable in any of the subjects. Conclusions: There is a selective increase in exhaled LTB4 and PGE2 in patients with COPD which may be relatively resistant to inhaled corticosteroid therapy. Most of the studies investigating the role of eicosanoids in COPD have used invasive techniques such as bronchoalveolar lavage5,6 or have measured these compounds in plasma or urine remote from the site of production.3,7 8-Isoprostane, a PGF2α analogue which reflects oxidative stress, is increased in exhaled breath condensate (EBC) in patients with COPD.8 EBC is a completely non-invasive method of sampling secretions from the airways.9–11 LTB4 and LTE4, but not PGE2, are increased in EBC in steroid naïve asthmatic patients compared with healthy subjects.12 The aim of the present study was to measure EBC concentrations of LTs and PGs in steroid naïve and steroid treated patients with stable COPD to identify possible selective profiles of eicosanoids in COPD. A random sample of 15 healthy subjects, 20 steroid naïve patients with COPD, and 25 patients with COPD who were treated with inhaled corticosteroids participated in the cross sectional study (table 1). Subjects attended on one occasion for clinical examination, spirometry, and EBC collection. The diagnosis of COPD was based on the Global Initiative for Obstructive Lung Disease (GOLD) guidelines.13 All patients had moderate COPD13 and were clinically stable with forced expiratory volume in 1 second (FEV1) <80% predicted and FEV1/forced vital capacity (FEV1/FVC) ratio <70% which did not change markedly over 8 weeks. Patients with other respiratory or systemic diseases were excluded from the study. All study subjects were ex-smokers and had stopped smoking for at least 1 year. Smoking status was checked by measuring urinary cotinine levels which were <10 ng/ml in all study subjects. None of the steroid naïve COPD patients had received corticosteroids in the previous 4 weeks. Inhaled β adrenergic agonists and theophylline were also used in some patients (table 1). Repeatability for eicosanoid measurements was assessed in 25 patients with COPD. A second EBC sample was collected within 7 days of the first sample. The study was approved by the ethics committee of the Royal Brompton Hospital and Harefield Trust and informed consent was obtained from all subjects. Spirometric tests were performed using a dry spirometer (Vitalograph Ltd, Buckingham, UK) and the best value of the three manoeuvres was expressed as an absolute value (litres) and as a percentage of the predicted value. EBC samples were collected using a commercially available condensing chamber, as previously described (Ecoscreen; Jaeger, Hoechberg, Germany).8 Subjects breathed tidally through a mouthpiece connected to the condenser for 15 minutes. The intra-assay and inter-assay coefficients of variability of the eicosanoid assays were within 10% and 15%, respectively. LTB4 and PGE2 measurements in EBC were qualitatively validated by reverse phase high performance liquid chromatography.15,16 The values of LTE4, PGF2α, and TxB2 were referred to as eicosanoid like immunoreactivity (LI). The possible influence of the ventilation rate on exhaled LTB4, LTE4-LI, and PGE2 concentrations was excluded as previously described.12 Saliva contamination of EBC was excluded by measuring amylase concentrations which were undetectable in all samples tested. Exhaled LTB4 was increased in both steroid naïve COPD patients (100.6 (73.5–145.0) pg/ml; p<0.001) and those treated with steroids (99.0 (57.9–170.5) pg/ml; p<0.001)] compared with age matched controls (38.1 (31.2–53.6) pg/ml; fig 1A). PGE2 in EBC was also increased in both steroid naïve (98.0 (57.0–128.4) pg/ml; p<0.001) and steroid treated patients with COPD (93.6 (52.8–157.0) pg/ml; p<0.001) compared with healthy subjects (44.3 (30.2–52.1) pg/ml; fig 1B). There was no difference in exhaled LTB4 (p=0.43) and PGE2 (p=0.59) concentrations between steroid naïve and steroid treated patients with COPD. LTB4 (p=0.86) and PGE2 concentrations (p=0.57) were similar in patients with COPD treated or not treated with theophylline. There was no difference in LTB4 (p=0.89) and PGE2 concentrations (p=0.23) between COPD patients treated or not treated with β2 agonists. (A) LTB4 and (B) PGE2 concentrations in exhaled breath condensate in healthy subjects (□), steroid naïve patients with COPD (▪), and steroid treated patients with COPD (▴). Median values are shown by horizontal bars. There was no difference (p=0.31) in LTE4-LI between healthy subjects (15.5 (11.0–27.0) pg/ml), steroid naïve patients with COPD (23.3 (9.1–31.3) pg/ml), and steroid treated patients with COPD (19.5 (9.0–42.0) pg/ml). PGF2α-LI was measurable in five steroid naïve COPD patients, in six steroid treated patients, and in five healthy subjects. In those subjects in whom PGF2α-LI was measurable, its concentrations were higher in steroid naïve (15.0 (10.9–19) pg/ml; p<0.05) and in steroid treated patients with COPD (14.7 (10.0–21.7) pg/ml; p<0.05) than in healthy subjects (8.9 (5.9–10.9) pg/ml). PGD2-MOX was measurable in six steroid naïve COPD patients (11.2 (8.7–15) pg/ml), in seven steroid treated COPD patients (11.4 (8.0–14.9) pg/ml), and in six healthy subjects (10.0 (8.0–15) pg/ml). In those subjects in whom PGD2-MOX was measurable, there was no difference in the levels of this PG between the three study groups (p=0.80). TxB2-LI was undetectable in any study subjects. 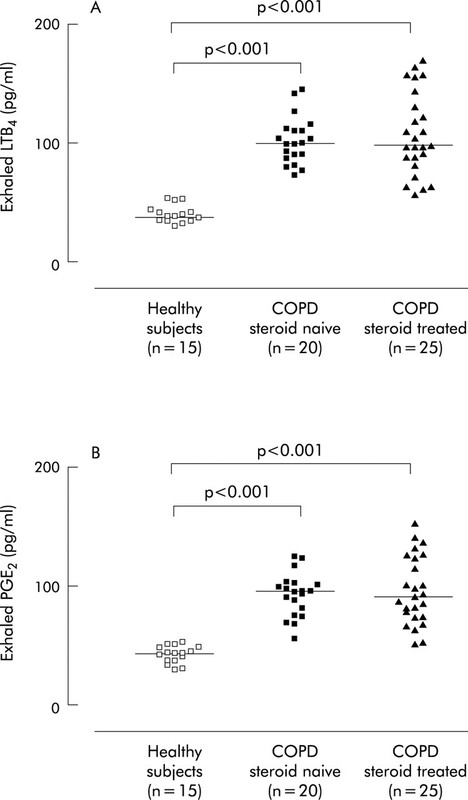 There was a correlation between LTB4 and PGE2 in both steroid naïve (r=0.75, p<0.001) (fig 2A) and steroid treated patients with COPD (r=0.67, p<0.001; fig 2B). The intraclass correlation coefficient was 0.72 for LTB4, 0.82 for PGE2, 0.68 for LTE4-LI, 0.79 for PGD2-MOX, and 0.73 for PGF2α-LI. The intraclass correlation coefficient for TxB2-LI was not calculated because this eicosanoid was undetectable in any study subjects. 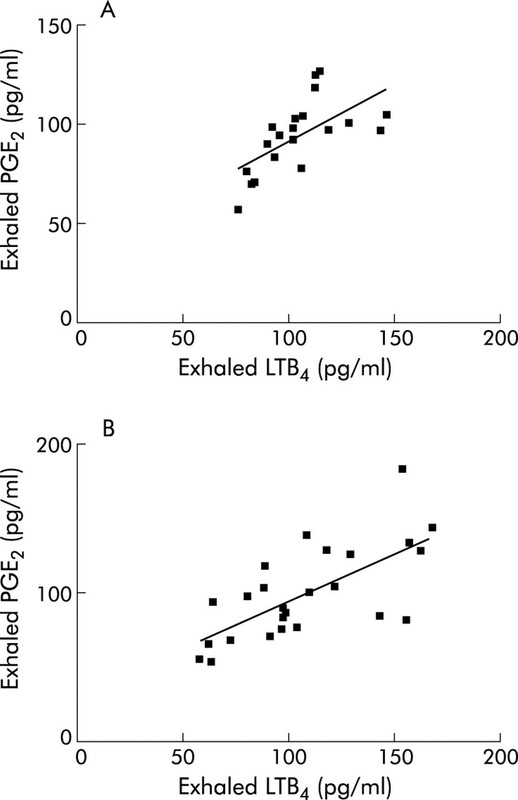 Correlation between LTB4 and PGE2 concentrations in exhaled breath condensate in (A) steroid naïve patients with COPD (r=0.75, p<0.001, n=20) and (B) steroid treated patients with COPD (r=0.67, p<0.001, n=25). We have identified the profile of exhaled LTs and PGs in COPD. Patients with COPD had about 2.5-fold higher LTB4 concentrations in EBC than age matched control subjects, consistent with a primary pathophysiological role for LTB4 in COPD.18,19 LTB4 concentrations in EBC were about 30-fold lower than those reported in sputum.20 Exhaled PGE2 was 2.2-fold higher in COPD patients than in healthy subjects. Since PGE2 may have anti-inflammatory effects in the airways,21,22 its increase, concomitant with enhanced levels of LTB4, a potent pro-inflammatory mediator, may represent a mechanism to counteract lung inflammation in COPD. This hypothesis is further supported by the correlation found between LTB4 and PGE2 in both steroid naïve and steroid treated patients with COPD. PGF2α-LI was detectable in the EBC in a few patients with COPD, and its concentrations were higher than those in healthy subjects. However, because of the small number of patients showing this pattern and the low concentrations detected, increased exhaled PGF2α-LI in patients with COPD is likely to be of limited biological relevance. The profile of exhaled eicosanoids in patients with COPD is different from that previously reported in patients with asthma.12 Exhaled PGE2 is selectively increased in patients with COPD, whereas LTE4 is increased in patients with asthma,12 but not with COPD. Exhaled LTB4 is increased in both asthmatic and COPD patients, but the increase was more marked in the latter. We have previously shown that exhaled TxB2-LI is measurable in about 50% of asthmatic patients,12 whereas no TxB2-LI was detectable in COPD patients in the present study. Identification of selective profiles of exhaled eicosanoids may help to differentiate between inflammatory lung diseases. The physicochemical properties of eicosanoids in EBC (volatile versus non-volatile) and their partition in EBC (aerosol particles versus water vapour) are largely unknown. The high inter-individual variability in the amount of aerosol particles in EBC indicates the need for a dilution marker.23 However, the selective increase of structurally related compounds in the single subject (LTB4 but not LTE4, and PGE2 but not PGD2) is likely to reflect a real increase in the concentrations of these eicosanoids. The effects of corticosteroids on eicosanoids in COPD in vivo are largely unknown. In our study there was no difference in exhaled LT and PG concentrations between steroid naïve and steroid treated patients with COPD. However, the cross sectional design cannot exclude steroid reduction of LTB4 or PGE2 and controlled studies with these drugs are required. Moreover, the effects of potential variables which may influence the effects of exhaled eicosanoids such as the use of previous medication, effects of feeding, effects of exercise, and diurnal variation need to be investigated. In conclusion, we have shown that LTB4 and PGE2 are increased in EBC in patients with stable COPD. The profile of exhaled LTs and PGs in patients with COPD is different from that previously reported in patients with asthma. Identification of selective profiles of eicosanoids in EBC, a completely non-invasive method, may be relevant for the diagnosis and management of COPD. This work was supported by Imperial College, National Heart and Lung Institute, London, UK and Catholic University of the Sacred Heart, Rome, Italy, grant “Fondo di Ateneo” 2001–2002. Zakrzewski JT, Barnes NC, Costello JF, et al. Lipid mediators in cystic fibrosis and chronic obstructive pulmonary disease. Am Rev Respir Dis1987;136:779–82. Seggev JS, Thornton WH, Edes TE. Serum leukotriene B4 levels in patients with obstructive pulmonary disease. Chest1991;99:289–91. Hubbard RC., Fells G, Gadek J, et al. Neutrophil accumulation in the lung in α1-antitrypsin deficiency: spontaneous release of leukotriene B4 by alveolar macrophages. J Clin Invest1991;88:891–7. Wardlaw AJ, Hay H, Cromwell O, et al. Leukotrienes, LTC4 and LTB4, in bronchoalveolar lavage in bronchial asthma and other respiratory diseases. J Allergy Clin Immunol1989;84:19–26. Verhoeven GT, Garrelds IM, Hoogsteden HC, et al. Effects of fluticasone propionate inhalation on levels of arachidonic acid metabolites in patients with chronic obstructive pulmonary disease. Mediators Inflamm2001;10:26–6. Asano K, Lilly CM, O’Donnell WJ, et al. Diurnal variation of urinary leukotriene E4 and histamine excretion rates in normal subjects and patients with mild-to-moderate asthma. J Allergy Clin Immunol1995;96:643–51. Montuschi P, Collins JV, Ciabattoni G, et al. Exhaled 8-isoprostane as an in vivo biomarker of lung oxidative stress in patients with COPD and healthy smokers. Am J Respir Crit Care Med2000;162:1175–7. Mutlu GM, Garey KW, Robbins RA, et al. Collection and analysis of exhaled breath condensate in humans. Am J Respir Crit Care Med2001;164:731–7. Montuschi P. Indirect monitoring of lung inflammation. Nat Rev Drug Discovery2002;1:238–42. Montuschi P, Barnes PJ. Exhaled leukotrienes and prostaglandins in asthma. J Allergy Clin Immunol2002;109:615–20. Global Initiative for Chronic Obstructive Lung Disease. NHLBI/WHO Workshop Report. National Institutes of Health. National Heart, Lung, and Blood Institute. Publication no 2701, 2001. Ciabattoni G, Pugliese F, Spaldi M, et al. Radioimmunoassay of prostaglandins E2 and F2α in human urine J Endocrinol Invest1979;2:173–82. Montuschi P, Ragazzoni E, Valente S, et al. Validation of leukotriene B4 measurements in exhaled breath condensate. Inflamm Res2003;52:69–73. Montuschi P, Ragazzoni E, Valente S, et al. Validation of eicosanoid measurements in exhaled breath condensate. Inflamm Res 2003 (in press). Chinn S. Repeatability and method comparison. Thorax1991;46:454–6. Peleman RA, Rytila PH, Kips JC, et al. The cellular composition of induced sputum in chronic obstructive pulmonary disease. Eur Respir J1999;13:839–43. Keatings VM, Collins PD, Scott DM, et al. Differences in interleukin-8 and tumor necrosis factor-alpha in induced sputum from patients with chronic obstructive pulmonary disease or asthma. Am J Respir Crit Care Med1996;153:530–4. Gompertz S, Stockley RA. A randomized, placebo-controlled trial of a leukotriene synthesis inhibitor in patients with COPD. Chest2002;122:289–94. Pavord ID, Tattersfield AE. Bronchoprotective role for endogenous prostaglandin E2. Lancet1995;334:436–8. Gauvreau GM, Watson RM, O’Byrne PM. Protective effects of inhaled PGE2 on allergen-induced airway responses and inflammation. Am J Respir Crit Care Med1999;159:31–6. Effros RM, Hoagland KW, Bosbous M, et al. Dilution of respiratory solutes in exhaled condensates. Am J Respir Crit Care Med2002;165:663–9. This work was performed at Imperial College School of Medicine at the National Heart and Lung Institute, Department of Thoracic Medicine, London, UK.